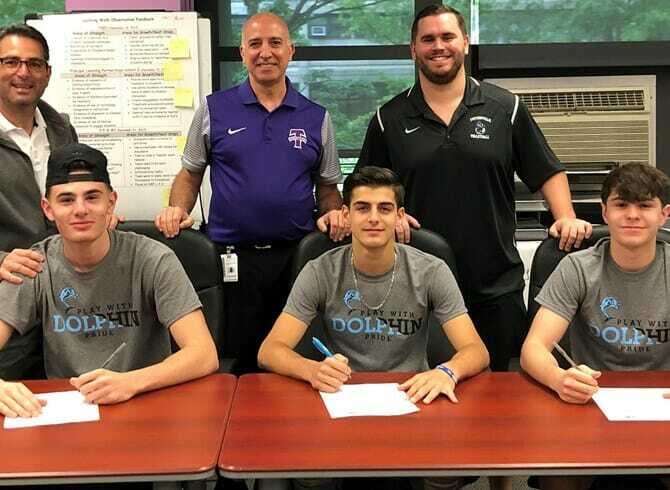 Staten Island, NY | Head Coach Lak Wai (Larry) Ng and the College of Staten Island men’s volleyball program is proud to announce the celebratory signing of three seniors from Tottenville High School in Staten Island, Giorgio Bellina, Nicholas Como, and Joseph Riotta. The trio joins an established nucleus and a large recruiting class that will look to raise the competitive bar of the program in 2018-19. Giorgio Bellina is expected to play a major role on the Dolphins line next season. A natural outside hitter, he poses a threat at the top of the net, where he looks to be a normal part of the rotation. He likes what he sees at the College of Staten Island, and was quick to make the school his choice this upcoming year. “I chose CSI because it is local, and I’ve met the team and they all seem like good, dedicated players who I would love to play with,” he said. Bellina enjoyed a solid career at Tottenville, culminating in an Outstanding Senior Award and the team’s Most Valuable Player honor. He hopes the quality on the court will translate over to the college game seamlessly. The son of John Bellina, Giorgio’s older sister, Gianna, played lacrosse in high school. Bellina’s teammate, Nicholas Como, is a quality player on the back line. The coaching staff is high on what the libero can do defensively keeping the ball in play, making him a player who has the ability to stay on the floor at all times. Como, who also played soccer at Tottenville and will look to do the same at CSI, was quick to make CSI his home the next four years. “I chose CSI because it is local for me and easy to travel to and I wanted to continue my volleyball career and possibly my soccer career as well,” he said. Como certainly has a strong athletic future ahead of him. He led the PSAL last year with over 200 defensive digs and he finished among the top five in service points, making him a threat behind the line. He also played two years of volleyball on the club level and is excited about the opportunity to have an impact on an upstart and rather new CSI team. “I feel like I can have an impact at CSI because I will work hard and always give my all to help the team win,” he noted. The son of Salvatore and Grace Como, Nicholas has an older brother, Vincent, and sister, Jenna. Alongside his exploits on the court, Nicholas was a recent recipient of a Daniel M. Donovan Jr. Congressional Civic Award. Rounding out the list of outstanding additions in time to help the team in 2018-19 is Joseph Riotta, a three-sport star at THS, competing year-round in soccer, basketball, and of course, volleyball. His decision to stay local was reinforced with his wanting to lead CSI ‘s program to new heights. “I love my hometown and CSI felt like the right place for me and gave me the best opportunity to be the best I can be as a student and an athlete,’ he said. An outside hitter with the Pirates, Riotta also played the point position in basketball and was a defender on the soccer pitch. His athleticism will be called upon on the hardwood under Ng. He was a SIHSSL All-Star in 2017 and is hoping that his experience in multiple sports helps him at CSI. The son of Joseph and Bernadette Riotta, Joseph has an older sister, Patricia. On top of his volleyball performance, Joseph has been a part of the Staten Island Stingrays basketball program for three years. Head Coach Ng is excited about the development Riotta can bring to the CSI table. In all, Ng is happy with the group coming in from Tottenville. The coach contends they will go a long way towards the future of the program. The CSI men’s volleyball team is one of CSI’s newest program, having turned varsity for the first time in 2015. They finished 6-16 a year ago, their first under Ng. With a first recruiting cycle underway, the Tottenville trio is set to join others to bolster CSI as a CUNYAC playoff contender and beyond.